I have given in this post a special Charm for women to control a husband. 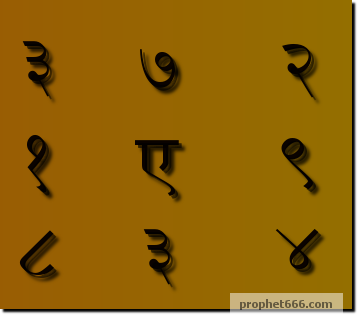 This charm which is a Vashikaran or attraction Yantra; comprises of unique vibratory combinations of 5 numbers and a letter. This charm is for those women who are facing all kinds of difficulties and problems from their husbands. This includes domestic quarrels, extra martial love affairs of the husband, addiction to liquor and drugs and other major problems. This charm has to be embossed on thick copper and always kept in your possession. This will bring your husband under your spell and you will be able to control and get rid of the problems which you are facing. if we can't embossed this on copper,can i write this on a white piece of paper with pen?please tell with what color of ink blue,black or red? This Charm will work on copper only. Since embossing is very expensive can engraving or etching be done? @Stella - It means after making you have to keep the charm with you always and no mantra is indicated in the post so no need of that. This yantra doesn't work at all. I got it made on copper in the same manner but it just doesn't help at all. My husband is still the same- no desire to earn, drinking constantly and lying to me and making his friends lie too to me. I hope desperately there is something else that can help me. @Stella - The results are not instant. You have to keep faith in God and results can take sometime to show. You cant expect instant results. hello sir,i cant find a square piece of copper in my area im in usa I tried india store where they sell puja stuff and they only have ready made yantra in square copper,it is ok if I go to plumber store and buy a piece of small copper pipe and have them cut and make it square.please help only the plumber store has copper. Sir Neel je im impressed by your work its a great way to ss people move in determined with purpose of Life. Iam a gemmologist & a Shiva- Shakti sddhak is it convenient to meet you please with further interests in the subject. Thanks you the kind words, I am only available online. AT GLOBAHACKING, wE consisting of highly efficient developers and hackers. +Upgrade University Grades +Facebook, Instagram, Twitter, Whatsapp, Line, Skype Hack +Delete unwanted online Pictures and Videos on any website +Remove Criminal Records +Hack bank accounts+Apps hacking+Mastercard, Paypal, Bitcoin, WU, Money Gram with untraceable credit on it etc. +We also develop hacked facebook, twitter, instagram, yahoo, gmail passwords etc. We do custom software and web development in php, java, asp.net etc.We have 100% records from our client as well as highest repeat hire rate.our work speak for ourselves, we provide a perfect software solution to all clients. We believe in mutual growing with client and hence we work as a technology partner and consultant for our clients.